I've been browsing the Asian market again. It's a great place to find new-to-me foods, which is actually somewhat surprising to me. I grew up with Chinese and Vietnamese neighbors and close friends, our family hosted 4 Japanese exchange students when I was a kid, I had Chinese and Thai roommates and a Korean boyfriend in college, and I taught for 11 years at a school with predominantly Filipino students. All of the above shared their foods and culture with me on a daily basis. I've tried a lot of different Asian foods. Yet, at least half of the foods at the Asian market are completely unfamiliar to me. The challenge isn't finding a new-to-me food. It's deciding which seems interesting enough to purchase and try. 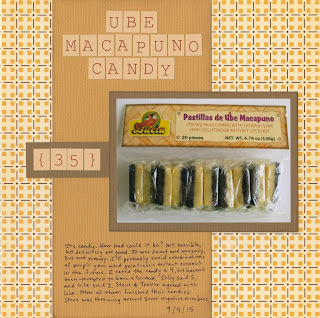 When I saw the Pastillas de Ube Macapuno, I was interested. The name translates to Purple Yam and Gelatinous Mutant Coconut Candy. How could I not try gelatinous mutant coconut?! I bought it. I'd assumed "gelatinous mutant coconut" was a bad translation, but no! Gelatinous mutant coconut is an actual thing. And it turns out that it is frequently paired with purple yam to make cake, ice cream, salads, drinks and more. So how was it? Unfortunately, the candy was not as awesome as its name. Kelly described it as "not good, but not horrible" which is pretty much how I felt about it. I gave it a 4. Kelly said 5. Lisa gave it a 2. She didn't finish hers. Trevor and Steve tried some after Trevor got home from school. Neither of them finished theirs either. Trevor agreed with Aunt Lisa, rating it a 2. Steve was mentioning negative numbers, so I put him down as a O.
Yikes! Too bad it didn't turn out as good as it's name! Well, it did sound interesting! I had no idea gelatinous mutant coconut was a thing. I was so curious, I had to follow your link. Hmmm. 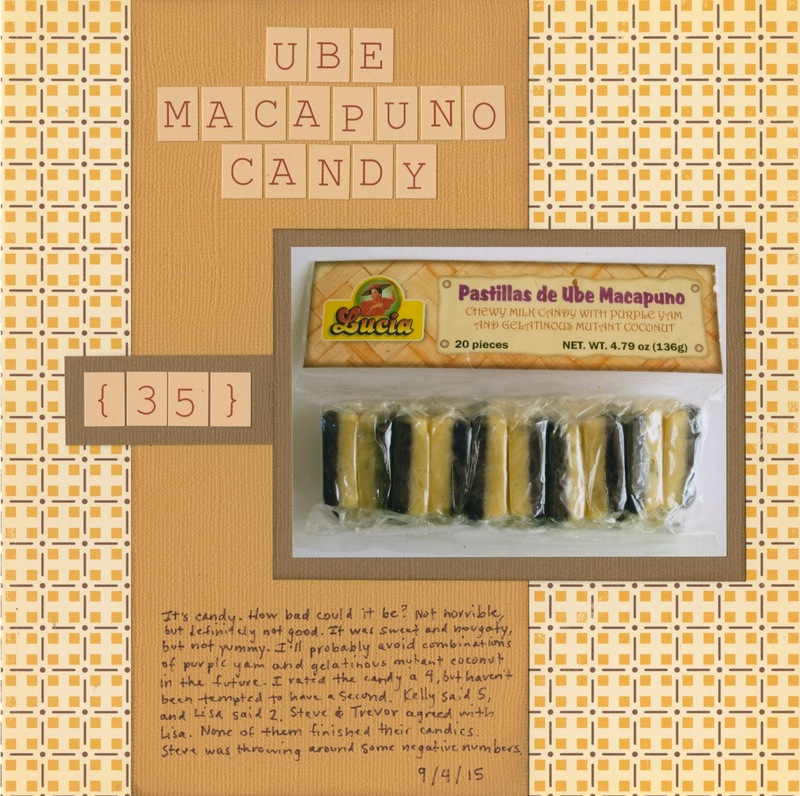 When I first saw the name - Ube Macapuno - I was thinking it might be an Asian translation of mascarpone. Which would be a good thing! Well,l on the plus side, your layout looks great! Mutant candy sounds scary...but it's candy so... you'd think despite it's weird name it would be good; what candy isn't?! Apparently you found it, LOL! ANd I agree it's a great layout! I like the way the photo looks 3-D, like you actually adhered the pack of candy on the layout! Very cool! BTW - thanks for the love on my last blog post. Sorry I haven't been visiting you much...I kinda went through an avoidance off all things creative... I was feeling overwhelmed every time I would think of diving back into being creative, and unfortunately reading creative blogs and even visiting SB.com set me off! Weird, I know! Having a daughter adopted from China gives us lots of opportunities to try Asian foods. This one I have never heard of, and to me, sounds distasteful, to say the least!!! LOL!!! I love that you tried it, Cindy. And I really like your wonderful layout, too! Mutant would have scared me off...hehe. Actually, I think it would be better for you to try new food at a dining place instead of buying prepackaged food....I think something made fresh would always taste better.